Five years ago the Rhode Island Department of Transportation repaved part of Route 116 in Smithfield. The state told everyone living along Pleasant View Avenue — as it’s known locally — that the DOT would take down their mailboxes and the state would provide new ones, in part because new sidewalks were being laid. It sounded great in theory, but Tony Polseno, whose family owns Pleasant View Orchards, had a bad feeling about the state’s plans. For 50 years Polseno had seen snowplows come by, taking out mailboxes that were too close to the road. Pleasant View Avenue is littered with dozens of boxes that have been damaged, knocked over or knocked off altogether. And the neighbors, who originally complained to the state after the first take-downs, have all but given up trying to contact the DOT. Kostas Revis is a lifelong resident of Smithfield. He says the state dropped a mailbox off at his house after his first one got knocked off, but didn’t offer to install it, adding he had no idea how to do it himself. So it sits. “They pretty much just gave us the mailbox and didn’t want to hear anything about it,” Revis said. Earlier this month we contacted the DOT about the situation, sending the department pictures of what we found. We sat down with DOT managing engineer Robert Rocchio, a 24-year veteran of the department. Jim Hummel (Motif): Why would the state insist on its own mailboxes? Robert Rocchio: That’s a very good question and it comes down to safety. Safety reasons. We have to make sure, while we want the mailboxes to be sturdy and stand up to the elements or to vandalism, they also have to be safe when struck by a vehicle. That means they can’t be so rigid that if a vehicle hits it could penetrate through to the passenger compartment or launch a vehicle. The mailboxes themselves have to be light enough so if they fly through the air as a projectile they don’t penetrate the windshield and injure someone. So it’s really because of safety reasons. JH: What sounds good in theory sometimes gets lost in the execution. I talked to a lot of people now who say, ‘What I had was fine.’ The practical effect is a lot of them are bent over, they get knocked off. The people out there feel abandoned in that when they’re trying to contact DOT now, it’s crickets. RR: Yeah, there’s definitely an issue there. There is a large percentage, I went out there myself, and there is a large percentage of those mailboxes that are either bent or somehow distorted. Rocchio said after surveying the situation and talking about it with DOT director Peter Alviti, the department is now going to take some action. 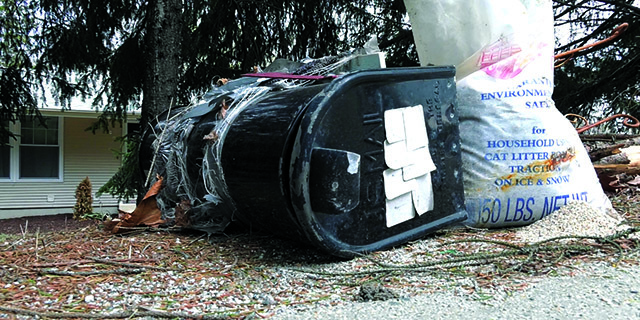 “The director committed that we will go out there and replace every mailbox that is bent or broken, and we will fix that soon,” Rocchio said.